It’s been a few months since the infamous YouTube “Adpocalypse” began heating up. Since then, a boycott of YouTube by major brands has forced YouTube to re-adjust their monetization rules, which now has certain creators feeling the burn. In addition to outright demonetization, what’s most notable about the “Adpocalypse” is that videos are now losing ad revenue in less obvious ways. In April, YouTube introduced new safeguards which allowed marketers to opt out of running ads against certain videos by category. Brands can now decide to remove ads from videos that feature “tragedy and conflict”, “sensitive social issues”, “sexually suggestive content”, and more. Sensitive social issues: Discrimination and identity relations, scandals, and investigations, reproductive rights, firearms and weapons, and more. Tragedy and conflict: Obituaries, bereavement services, violence, war, missing persons and more. Profanity and rough language (beta): Moderate or heavy use of profane language and curse words. Sexually suggestive content (beta): Provocative pictures, text, and more. Sensational and shocking (beta): Content that creates shock value, including sensational, gross, and crude content. While these rules were designed to help protect advertisers, the reality has been broad sweeping demonetization of content, suppression of content, and a lot of confused creators who are starting to wonder who the “You” in YouTube really is referring to. At first, this may seem like an effort to balance the needs of sponsors and advertisers and those of creators, but it’s also become increasingly clear that YouTube is not-so-subtly nudging creators only to make content that is palatable to major advertisers, or else suffer financially. Like most technologies these days, an algorithm is largely responsible for carrying out these guidelines. YouTube acknowledges the automated process isn’t perfect and offers a manual review process. This allows users to appeal videos marked “Not suitable for all advertisers” and a chance of gaining advertisements. However, it’s this time-sucking review process that’s doubling the headaches for some channels. A recent update from YouTube reassures that an updated algorithm will result in millions of videos becoming fully monetized instead of being listed as not suitable for all advertisers. YouTube has said that through the process of creators appealing their demonetized videos, the technology has been “trained and improved” to help better figure out what’s actually unsuitable for advertisers and what’s okay. These days, many creators agree that the old methods of content monetization simply aren’t worth the effort. For new people who are interested in starting a channel to provide additional income, it’s become even less viable as the changes to YouTube’s monetization rules require all channels to have at least 10,000 views before they’re offered the chance to start running ads on their content. So what’s the best way to start, and continue, earning consistent income from your content now? With an over-saturated content space, where everyone is trying to “go viral” and advertising fees are declining, it’s becoming clear that it’s not enough to simply produce videos and pray that you get enough views to start monetizing content. To be successful on YouTube now, it pays (literally) to start being a professional marketer and build a strong community that will help support you. One of the most straightforward ways for creators to support themselves now is to simply ask for help from their community. San Francisco based Patreon has emerged as an alternative model for raising funds for YouTubers who are unhappy with the current state of affairs. Patreon lets viewers make monthly and ongoing ‘pledges’ that benefit creators directly. Their website claims that they have so far sent over $150M to creators. Florian Wittig, 30, is one of the producers of the Great War channel. Since 2014, the channel has published nearly 500 educational videos about World War I, each week posting three to four new episodes. Unfortunately, because their videos regularly deal with the topic of war, 75 percent of their videos have been flagged for manual review. In a recent video, Wittig asked viewers to support the channel through Patreon. Because of YouTube’s new ad regulations, many creators like Florian are also turning to Patreon to fund their projects as a better source of independent revenue. “We made it clear a while ago that Patreon is the main reason why we can continue to make this show,” Wittig says. While Patreon can be a great source of revenue for creators with a generous audience, the service charges a five percent fee from the money that is raised for the creators, and due to its donation-based model, is not always a guaranteed income. Although Patreon has been a great source of support for many creators over the last few years, the service also puts creators at the mercy of an intermediary, which may raise concerns for those who are already tired of dealing with YouTube. One alternative that may soon solve this problem is the open-source browser Brave, which is introducing their “Basic Attention Token” system. This is a type of utility token based on the Ethereum technology that can also be used as a form of “credit” between advertisers, publishers, and users in a new, blockchain-based digital advertising and services platform. By emphasizing the need to connect viewers and YouTube content creators, he adds, “Brave reconnects users directly to content creators.” Again, this system relies on a donation-based model, but with a more direct connection with the audience meaning (hopefully) less bureaucracy and more revenue. YouTube affiliate marketing is one of the most popular and scalable solutions you can invest your time in. YouTube’s audience is only going to grow in the coming years, and because of the lower competition found in niche circles, you won’t find it as hard to start getting viewers. If you’re already a serious content creator on YouTube, there’s a good chance you have at least one affiliate offer somewhere in one of your videos. YouTube is so massively popular among creators and consumers that it just doesn’t make any sense not to. However, it’s probably worth making a distinction here between casual marketers and professional affiliate marketers. In the first category are content creators who happen to place the occasional affiliate link in their videos. For them, affiliate marketing is one more way for them to make money, but not the only way, as these folks often make enough money from ad views, multi-channel-network agreements, and even attempts to diversify into more conventional gigs like music or acting (Looking at you Jake Paul). In the second category are channels that exist solely to earn affiliate commissions. For such content creators, all content development revolves around its ability to earn affiliate commissions. This is by far one of the easiest and most reliable ways to start monetizing your videos, and an absolute must if you aren’t collecting income from other areas! What’s great about this approach, and what makes it so accessible for new YouTubers, is that they don’t need to be famous off-the-bat to start earning money. There doesn’t need to be a viral “hit” as long as you understand your niche and provide solid content for it. By figuring out a niche where your videos could be valuable, you can effectively produce content that acts as a double-edged sword to simultaneously entertain and engage your audience, while still marketing a good deal to them. Your audience is super targeted, as most affiliate niches rank for a keyword with strong commercial intent. Your offers convert well and usually pay a strong referral fee. On the other hand, a “reaction video” may be shared heavily but won’t earn as much money because neither the traffic nor the offers are accurately targeted. Many large channels are simply relying on increasing their upload rate or resorting to “clickbait” titles in order to drive more views and make up lost revenue for demonetized videos when in actuality it’s becoming safer to distance yourself from that model entirely. What do you need to do to become a successful affiliate marketer on YouTube? Pick a niche that you think you can make good – educational content about. It could be vacuum cleaners, fondue machines, or anything else you can produce regular videos about. As long as you’re smart about marketing your content to your niche audience of Vacuum Cleaner or Fondue enthusiasts, and you produce regular professional content, people will click on your videos and ultimately click your links. The only caveat is that you must have your content game on lock if you want to succeed at YouTube marketing. Stay away from any tools that claim to turn articles into videos “automatically” and avoid spammy content at all costs. Get accepted into a good affiliate program which supports your niche. One of the most accessible affiliate programs, and one we recommend is Amazon’s Associate Program. Unfortunately, you can’t register for the Amazon Associates using just your YouTube channel, so you’ll need to have your own website that needs to be informative and relevant to the products that you plan to promote. Unless you have a good website set up, you shouldn’t apply for their affiliate program, because it’s likely your application will be rejected. By having a proper website, you can also drive traffic to your videos or product reviews directly from Google. SEO is king here! Make it as easy as possible for your audience to make purchases through your links. Amazon has 12 international storefronts around the world, which means that when you share a link to a product from one storefront, you’re sending some of your international audience to the wrong store. Your French viewers won’t want to purchase a product from Amazon.com if they have to pay for international shipping! Be transparent. The #1 reason affiliates get shut-down by their programs is for not being clear that they’re an affiliate, or where their links go. Be as honest as possible with your audience and show them you have nothing to hide. You’re just trying to help make informed purchasing decisions! Geniuslink was created to help solve this problem and to help our users succeed at becoming the best online marketers they can be. By using an intelligent geni.us link in your YouTube videos, you guarantee that your viewers are always sent to their local storefront, which means improved conversions, and happier customers! Ultimately, it all comes down to smarter marketing tactics. 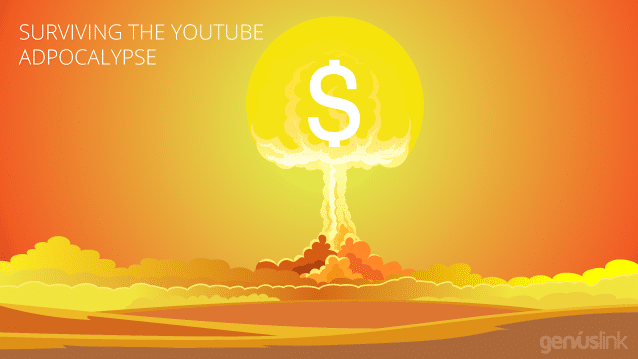 To succeed on YouTube in the post-“Adpocalypse”, you’ll want to start thinking of ways to produce content that you can monetize more reliably or ways to make it even easier for your audience to support you. So figure out your niche, produce awesome targeted content, and optimize your links to make your clicks as valuable as possible. You may be surprised by how easy it is to survive in this scary new “brand-friendly” wasteland if you’re smart about it!